This is the second piece of a personal project I am working on over 2017 entitled “Body Text” that explores our complicated relationship to our clothing. Follow along on my instagram and/or tumblr blog. The topic of fast fashion resonates with me as it includes 2 areas I’m interested in- how to make your clothing feel like your own and express what you would like it to express; and managing money and resources. I think cheap clothing can work for or against both of these. Shopping constantly to keep up with trends can make everyone look pretty same-y. On the other hand, many of the cheap clothes are decently well-made, and can be customized, kept for a long time, and combined with more unique or handmade items. And obviously- shopping for cheap clothing can save a lot of money… as long as it isn’t done constantly. If the low cost of clothing is used to justify buying massive amounts, it becomes more expensive as you need more space to store the clothing (not to mention the time cost of all the shopping), it’s harder to move, and more expensive (especially if you look at the city-wide level) to dispose of. One thing that really struck me while working on this project is how hidden a lot of the costs of purchasing cheap clothing are. According to what I read, the quality of much of the clothing we buy has gotten so poor that even if we donate it to charity, it’s unusable- even by very poor countries. As in, most of it is worth less than a nickel per pound, even to textile recyclers. And it costs A LOT for cities to dispose of- which we pay for via taxes. It’s a deep topic that I admittedly haven’t fully investigated with this infographic. I can see doing full projects dedicated to exploring very narrow aspects. For example, I read about whole cities in China that are dedicated to producing one item- like neckties. And pondered whether extremely cheap clothing is worth the trade-off of not having the clothing manufactured in the US, and the associated loss of jobs (I don’t know the answer to that one, but lean towards “not worth it.”) I read some crazy statistics- for example, apparently if every man, woman, and child in China bought 2 pairs of wool socks, there would be no more wool left in the world! And wool isn’t even that expensive right now. My take-away after doing this project and thinking about it is this: We all need to wear clothing, and that clothing needs to be manufactured somehow and somewhere. Probably buying less, but more expensive, clothing of higher quality manufactured in the US would be better, but that cat’s out of the bag, and it’s not going back in, at least not any time soon. We have to do the best we can with the reality as it stands today, though perhaps that reality will slowly change if enough people change their personal habits. I don’t think it’s terrible to shop at places like H&M, Uniqlo, Zara, etc. They carry good-looking products that are sometimes reasonably well-made and very cheap. But I think that the way to do it is to pick only what you really like and need, selecting the best quality you can from their offerings, with the mindset that you will wear it for a long time. Then, don’t treat them as disposable- take care of the clothes so that they last. Learn simple repairs, and repair them when you need to. Basically, shop for and treat cheap clothing the same that you would expensive items. Personally, I am now thinking harder about what I really “need”. Do I already own something similar? How few pairs of something can I get away with? What do I own that I can I repair or alter to give it more life? In the future, I may do projects on the topics of how to repair clothing, and how to tell a piece of clothing’s quality. 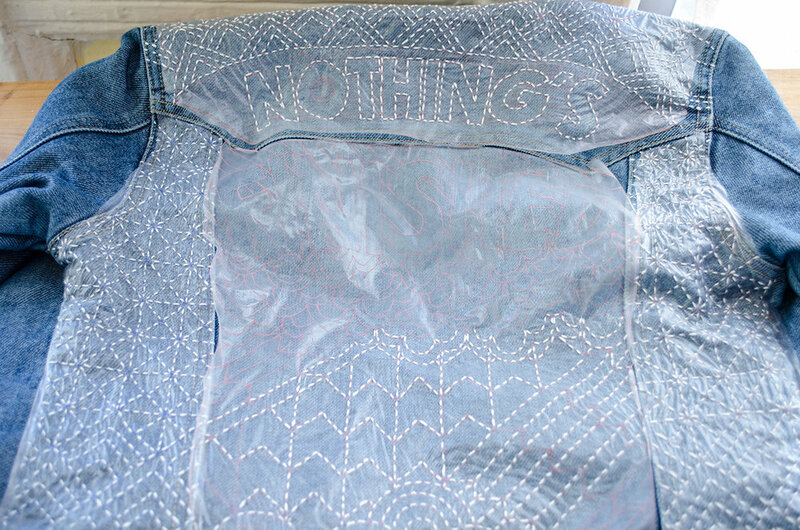 I am experienced in hand and machine embroidery, applique, and tailoring. The preciseness of this project, however, meant that I needed to do a lot of problem solving. Normally, I will either freehand sketch or trace a paper sketch onto my fabric using a lightbox. In the past, I’ve also treated fabric with bubble jet set, ironed it onto freezer paper, and run it through a printer in order to get my template to stitch over. The infographic really needed to be designed on the computer, and as I wanted it to look fairly precise, the freehand tracing method wouldn’t have worked. I made some test swatches and quickly realized that it was going to have to be pretty big in order to read well and look as neat as I wanted. Of course, that also meant it was going to take a lot longer. I originally figured it could be like 8” wide, and would take maybe a month to embroider, which is laughable. The fabric pieces are 17” wide, 13.3 feet long, and took 4 months to embroider. I am aware that I almost always underestimate how long my projects take, but this was ridiculously off. That said, it felt like I made quick progress throughout- it is just really BIG. Obviously, at that size ironing the fabric onto pieces of freezer paper and running it through a home printer wasn’t going to work. What I ended up doing instead was getting it printed on fabric via Spoonflower. This worked GREAT. I designed the infographic in InDesign, then broke it up so that it would fit onto their fabrics according to their specifications, and then used that as a template to stitch over. The downsides were that Spoonflower is super slow- I ordered test swatches first (which is how I figured out that the text would have to be large or else I would run into legibility issues), which took 9 business days to arrive. I used the swatches to adjust the sizing and transparency of the colors, then sent out for the final fabric, which took at least another 9 business days to come. It was basically a whole month of researching, planning, designing, and ordering fabric before I even began the stitching part. That said, it worked super well. I ordered gigantic spools of red, black, and white embroidery floss off of Amazon. I mostly separated the threads out and used 2 or 3 threads, unless I needed to fill in something large. I think using 2 threads looks the nicest, though I varied it depending on the font sizes and weights. Recently I’ve been into embroidering with just a single regular sewing thread, but for this project, that would have taken waaayyy too long. I like hand embroidery because it’s so easy to pick up and put down. I worked on this most days in the evening, and found it very enjoyable and relaxing. When all the pieces were finished stitching, I had to figure out how to scan them all in. This was actually the worst, most tedious part to me. They really needed to be stretched tight so that they weren’t distractingly wrinkled and messy looking, but of course, they’re way too large to fit on my scanner. I ended up buying a plastic cutting board from the dollar store, covering it with black paper, and then pinning the pieces to the cutting board in sections. Then, I went back and stretched each embroidered part over the largest embroidery hoop I have (10” I think? ), pulled it as tight as possible, and scanned that. It took over a week, and I ended up with like 120 scans or something crazy. I pieced them all together in photoshop. I actually had to do a fair amount of work digitally- just piecing all the best parts together was a nightmare. The problem I found was that I wanted there to be SOME texture so that you could quickly tell it was all sewn and handmade, and that the background was actually really fabric, but too much looked messy. It was a really fine line, but I’m satisfied with where it ended up. When I conceived of the idea, did the research, and designed the infographic, I felt like I was being pretty thorough. 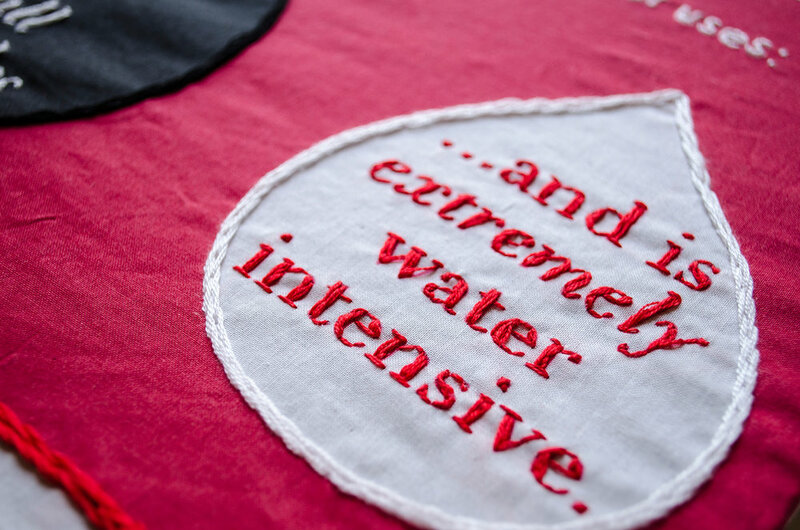 In the 4 months of stitching that followed, however, I had plenty of time to contemplate, and realized that I spent less than a week on the research, about a day on writing, and then maybe a week on the design. And I had to admit to myself that I went through that first part, particularly the writing, really quickly because I was so eager to get to the sewing. As I was stitching and reading back the words I’d written, a lot of times I felt a little like...ugh. Part of it is that I’m not a writer, and it was a kind of like hearing your own voice on camera and getting uncomfortable. But another part of it was that given the amount of time the production took, I felt very viscerally that if I’m going to work in this way, I need to feel REALLY STRONGLY about the subject matter. In retrospect this is obvious, but if I’m asking viewers to look at something and spend time with it, and notice that I spent a lot of time with it, I really want to feel like my message is clear and from my heart. I’m not sure what that will be yet, but I’m thinking about it way more deeply now than I was before starting this. I should also probably team up with a copywriter. “Global fashion industry statistics - International apparel." FashionUnited. FashionUnited Group, 2016. Vatz, Stephanie. “Why America Stopped Making Its Own Clothes.” KQED News. KQED Inc., May 24, 2013. Conca, James. “Making Climate Change Fashionable - The Garment Industry Takes On Global Warming.” Forbes. Forbes Media, LLC., December 3, 2015. Sweeny, Glynis. “Fast Fashion Is the Second Dirtiest Industry in the World, Next to Big Oil.” EcoWatch. EcoWatch, August 17, 2015. Wicker, Alden. “Fast Fashion is Creating an Environmental Crises.” Newsweek. Newsweek, LLC., September 1, 2016. Goldberg, Eleanor. “These African Countries Don’t Want Your Used Clothing Anymore.” Huffington Post. Oath Inc., September 19, 2016. Cline, Elizabeth L. "Overdressed: The Shockingly High Cost of Cheap Fashion." New York, NY: Portfolio/Penguin, 2013. I am a bit behind on my project due to moving. In addition, it's been more of a challenge than I thought to figure out the logistics. For Part 2, I decided to try using printed spoonflower fabric as a template. I did some test swatches, and it seems to be a decent method of working, except that they are INCREDIBLY slow. Once you put in an order, it's not even shipped for like 9 business days! And then it typically takes another 7 before you actually receive it. I did 2 test swatches before ordering a few yards of the final fabric, which I am currently waiting for. It is due to arrive this week. Once it arrives, I will have to actually do the stitching work. I will have more details on what I learn when I post the final piece. This is the first of a series of 12 pieces of a personal project I will be working on over 2017. I’m calling the project “Body Text”, and will use stitched lettering to explore our complicated relationship to our clothing. Follow along on my instagram and/or tumblr blog, and I hope you enjoy! The topic of my first piece is sashiko stitching. I felt that this was a perfect topic to kick off my project with, as there is not only a lot to work with visually, but the idea behind it resonates with me personally as well. 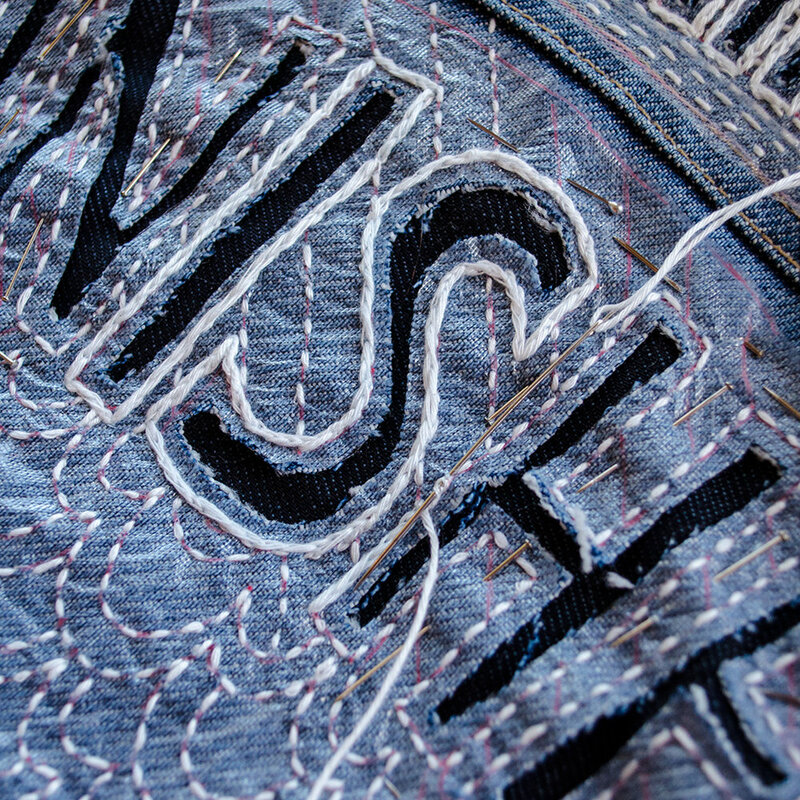 Sashiko was originally used by Japanese peasants to reinforce and winterize their clothing. The small running stitches would reinforce stress points, and repair worn places or tears. Seamwork.com has a good short history on it. It originated in the rural north of Japan, where it was too cold to grow cotton. Industrialized fabric production didn’t reach Japan until the 1870’s, and even then, it was very expensive. Therefore, cloth was mostly made by hand, and represented a huge amount of labor. Not wanting to waste any scraps, sashiko stitching enabled old fabric to be pieced together, and greatly extended the life of the cloth. It became a decorative thing as well as a functional one, with it’s own technique and designs. 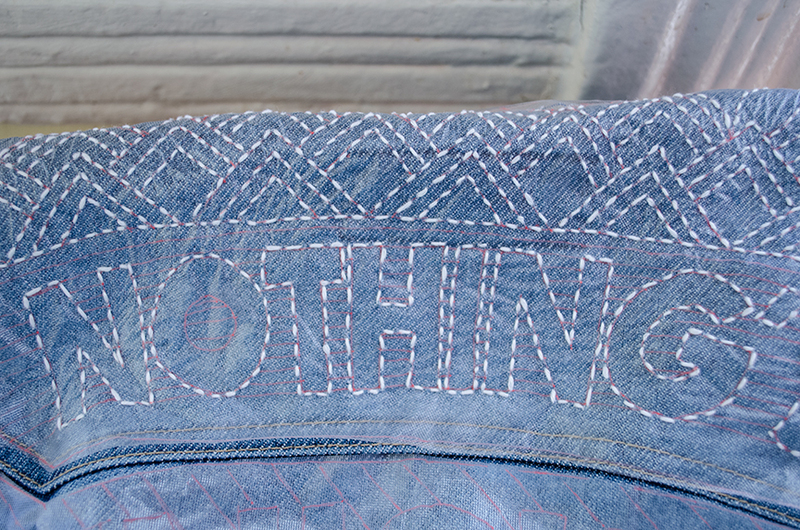 Conceptually, what I like about sashiko is the idea of embracing the flawed or imperfect. 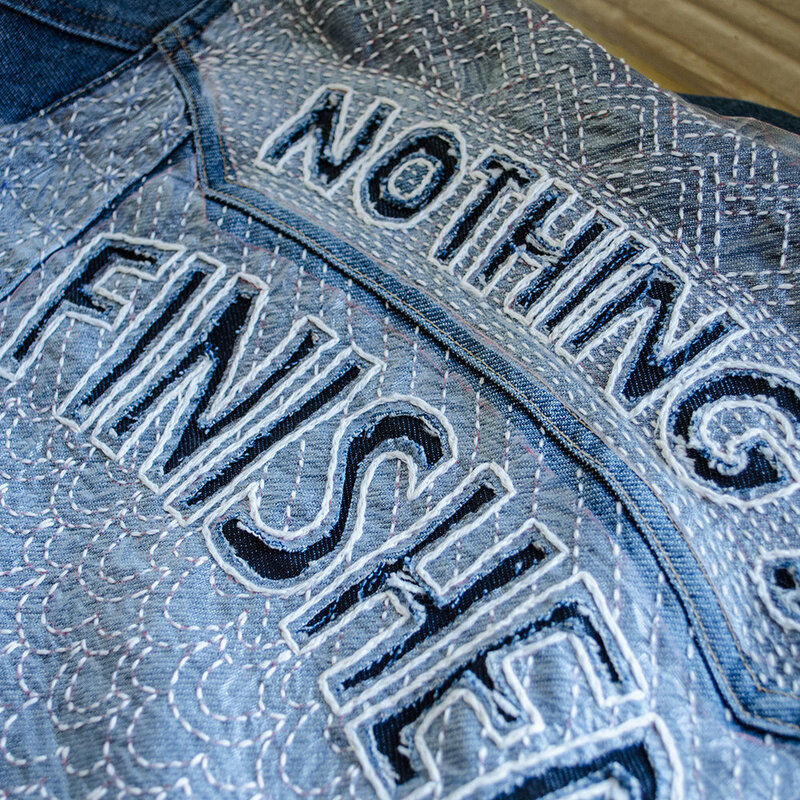 Patches and wear are not hidden, but made their own thing, more beautiful. I think this is a good metaphor for how to live life- acceptance of change and fate as aspects of human life. It’s interesting to me because clothes are often worn as a shield, or a mask- they project an image of how we would like to be seen. And this is often a good thing- you don’t wear the same thing to a job interview as you would wear around the house, because you want your potential boss to know that you will take the job seriously and be professional. If you go to a party, it helps make an exciting atmosphere if the guests dress in special outfits. However, I think that this idea can be taken too far; with clothing so cheap, it can become a substitute for real interests and personality. I am trying to now repair my clothing rather than buy new, and embrace the wear. I think it is important to let the mask down a little, and hopefully by appearing a more vulnerable, let others know that it’s ok to as well. 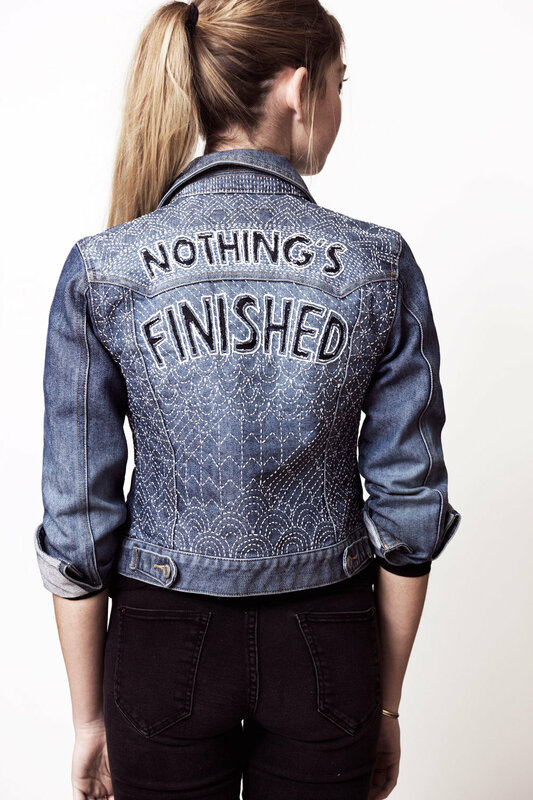 The words on the back are based off of the idea that nothing lasts, nothing is finished, and nothing is perfect. Sashiko was originally done in white thread on indigo fabric, and is geometric, with the pattern based on a grid. The traditional patterns are really beautiful, and look like abstracted hills, clouds, or waves. Here is a pinboard I made of some that I liked. Looking at them, I wonder if the different designs were influenced by the nature surrounding the places they originated from? I tried to keep this in mind when figuring out my own design. Sashiko is relatively easy, but there are a few rules. I couldn’t adhere to all of them for this project, and what I’ve made isn’t super authentic- but then, traditional sashiko didn’t incorporate lettering. I just used it as a jumping off point. Most of the rules are about what should happen when the thread lines intersect, and usually, they just shouldn’t cross. Stitches should end at the turn of a corner, and intersections should be open. Here is a good run-down of the rules. I realized while doing this why those rules are in place- leaving a little space where the threads cross really creates a nice design when the piece is finished. I mostly got that right, except for a few areas on the “clouds” in the center, especially where I had different types of patterns intersecting. I discovered a pretty amazing product for this project- Sulky Solvy. I’ve used water soluble interfacing in the past, but never a water soluble stabilizer. This stuff worked perfectly to transfer my complicated design, as it is transparent, and I could trace my design directly on it. I tried seamstress chalk first, and it was a total failure. My usual method of drawing straight on the fabric with a chalk pencil didn’t work for this, either, as it was based on such a specific grid. The Sulky Solvy was perfect for this project, especially since denim and sashiko thread are made to stand up to washings! I was also surprised with how well it took all the drawing, stitching, and general manhandling I subjected it to. I’d highly recommend trying it. I have a few things I would change about the lettering. After I’d already started and there was no turning back, I received 2 books I ordered about lettering: “Lettering Charts for Students and Artists” by Phyllis Brown, and “In Progress” by Jessica Hische. With my first reading of these excellent books, I realized there were some spacing and letterform things that I could have done better. In this project, it’s not such a huge deal because the letters are so tactile, but in the future, I think I can do better on the technical aspects of lettering. Final photographs are by Haroon Bhatti of Pomade. Hi! I am excited to begin sharing a personal project I will be working on over 2017. I’m calling the project “Body Text”, and it will use stitched lettering to explore our complicated relationship to our clothing. I am planning one piece per month about a variety of different topics, including facts about the clothing industry, simple mending and repairing techniques, decoration, money saving, and our fascination with brand names, sizing, and body image. Follow along on my instagram and/or tumblr blog, and I hope you enjoy!